For several years, but dramatically lately, the site has been down. 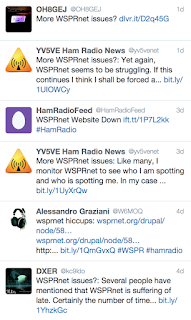 WSPRnet.org is both a Drupal based discussion board with key information about WSPR but more importantly a database of sports reported by the client applications. It wouldn't be so bad if just the discussion forum was down, but when the site goes down we lose the reports from remote stations as well. This could be critical for hams tracking beacons on balloons and of course is now relied on to get a view of propagation around the world. The problems have not gone un-noticed not just in the forums (when up) but also on Twitter. "This excellent web site is written and maintained by Bruce Walker, W1BW. We haven't heard from Bruce in quite some time; presumably he's very busy with work or other obligations. I think we need a volunteer who knows web programming to pitch in and help, perhaps sending Bruce a priority letter by FedEx or something to get the process started. I'm the author of an iOS application "WSPR Watch" that crawls the site to report spots and in the past I've tried to contact the site administrator to make sure I am being kind to the site. I was unable to get a response. The site is well designed and has a great deal of functionality for displaying, searching and mapping spots. The Drupal based discussion forum is fine and should remain as is, but I think that the spot database should move to a different domain and be backed by a cloud based scaleable architecture. The project should be managed by a team in the open. The spot database should provide APIs both for client apps and reporting apps (like my WSPR Watch and iWSPR). These APIs should require a license token and be protected from overuse. 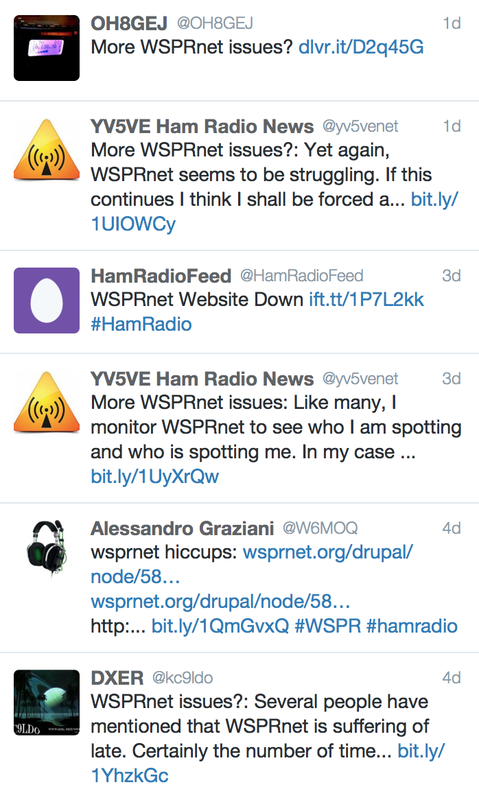 Hopefully wsprnet.org can return 301 Moved Permanently responses and the clients will jump over to the new API if not there will be a period of disruption but in the end we will end up with a system that can take us all forward. I'm here to help as are many others. I'm grateful to the work done by Bruce Walker and I hope he's ok. What's the next step? Completely agree with this. I've been looking for a way to display an auto updating map in a modern style as part of the Edinburgh Maker Faire. The idea is I get people to provide power to the beacon with a hand wound generator and a few seconds winding charges a supercap to power it for a transmission period. They can then see who received the transmission round the world on an automatically generated (and auto refreshing) map. Given the recent reliability issues, I'm less sure of this at the moment and there is no API to pull the data (I'd ideally use a mashup of google maps). I'd love to see some sort of dx cluster style submission system where there was a cloud and each server shares spots with the others in the cloud. Any server can be interrogated for spots or a new spot submitted to it to pass on to the network. This would allow redundancy and some nice options for running a cluster server and doing data processing rather than hammering another server through the API. I'm wondering if a group should get together and create the infrastructure. That way we could push a patch for the wspr apps to submit using both methods initially rather than wait. I was thinking that if a compatible alternative database was built then users could add an entry to their hosts file to point to the new one, but adding a feature to clients to report to more than one database is a good idea. The only API for querying the current data, as far as I know is either the legacy database or scraping the current listing which is what my WSPR Watch app does. I think there used to be a way to download bulk spots in a csv zip file or similar and it would be good to encourage research on the data without DOSing the server. I've been able to improve my network timeout code in the app which is a plus. I have Bruce's email and will send him a note.